Rattling noises, banging and squeaks or howls are common issues, especially for properties with aging plumbing and drainage systems. Although not particularly dangerous for the plumbing system itself,noisy pipes are a real nuisance to put up and live with. Silencing noisy pipes doesn’t always require qualified assistance, though before you begin to perform the check-ups and repair, consider your own personal handyman skills and as to avoid any hiccup along the way. Many times, noisy pipework is caused by bad anchoring of plumbing infrastructure. Loose anchoring is an easy fix. Check all the visible pipe anchors, many of them tend to loosen up or move out of place over time. Anchoring is usually done using metal clamps which can be removed, tightened or replaced without too many issues. It might be necessary to add more clamps in certain sections where pipework seems too shaky. You should a have properly tightened anchor for every two or so metres of pipe. Avoid using non coated metal clamps or anchors on metal pipes as even small bangs make a lot of noise. Rattling or banging of pipes can also be eradicated by adding cushioning. If you don’t want to spend money on special-purpose cushioning like pipe insulating foam, by all means use any other suitable piece of rubber you have at hand. Secure the insulation to the pipe and then secure the pipe to the wall using the same anchoring method, when insulated the pipe must be anchored to the wall (or other surface) every hundred and twenty centimetres. Leave some room for expansion when fitting the cushioning – this is important when insulating plastic pipework. Water hammer is one of the most annoying and loud issues caused by pipes. The problem stems from the lack of air inside the water supply pipes. Air acts as natural cushioning inside pipes when water is turned on or off. Check air chambers for water. If they are indeed full of water, switch off water supply from the main valve of the property. Turn on all the taps throughout the house and let them drain completely. When drained, shut off all the faucets and restore water supply from the main valve. This usually helps restore air in the system and quiets water hammer. 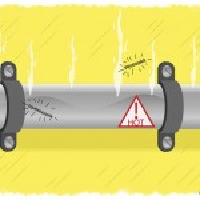 Banging noises coming from pipes are usually caused by water pressure problems. You can easily check water pressure in your home by using a pressure gauge commonly found in every hardware store. These gauges are cheap, easy to use and quite accurate. Follow instructions on the gauge and attach it to a regulated tap, not one that you added on later. If reading correctly, water pressure should not exceed eighty psi. High water pressure problems must be handled by qualified professional plumbers so call for assistance if the readings exceed the figure from above. Squeaky hot water pipes are another common issue for many homes. The constant expanding and contracting of hot water pipes causes to them rub hard against anchoring clamps thus the squeaky noise they make. Insulate pipe clamps using the same foam or rubber mentioned earlier in the article. When doing this make sure no hot water is flowing through the pipes in order to avoid personal injury.